Windows Smart Screen protects you from running Applications from an unknown source which need specific system resources, or applications that try to get access to vital Windows and User Parts. Shortly said: It protects you from potentianly dangerous software. However sometimes, such as a piece of software I wrote, the protection is unwanted. 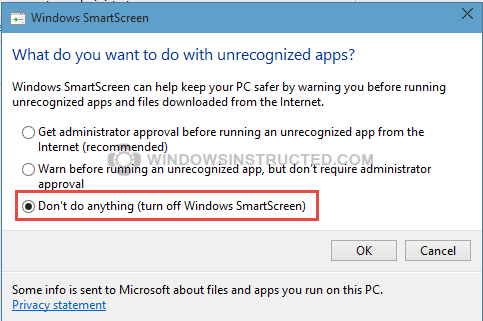 How To Disable Windows SmartScreen in Windows 8 and How To Disable Windows SmartScreen in Windows 10? We’ll explain that. This how-to is for disabling the Operating System its Smart Screen. Not for disabling the Internet Explorer Smart Screen. Run a blocked program once. If you simply wish to run the application you downloaded because you trust the publisher then you can choose to do so. 1. Click when the warning “Windows Protected Your PC” appears on the More Info link. 2. Now a new button appears, Run anyway. If you sure about the program your running the click this. Before I give you the steps I must say that I highly suggest you do not disable SmartScreen. Anyway. That’s it, make sure you click on OK to save the settings. To enable SmartScreen again just repeat the steps and at step 5 choose the setting you wish.